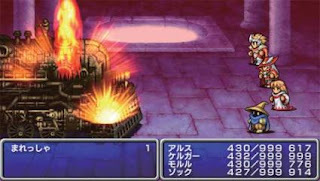 Not sure how many people out there are interested in buying and playing through the original Final Fantasy one more time, but word has hit the street that the PSP remakes of Final Fantasy I and II will be released in the U.S. on June 26 and July 24, respectively. Personally, the original Final Fantasy is one of my favorite games ever, so I may have to give it a whirl if I ever pick up a PSP. I've played nearly every incarnation of the game that's been released and re-released over the years--on the NES, the PSone and the GBA--so why not do it all again, especially considering the graphics have been overhauled? Final Fantasy II, however, I've never been so keen on. I tried playing through it on the PSone, but found it boring and never made it too far. I'd be more willing to give it another go if it and the original game were packaged together for the PSP, but as of now the games will be sold separately for $29.99 each.